Forget the malls, ladies. It’s all about An Afternoon of Fashion on Sunday, March 4 at the historic Hollywood Tower Apartments. 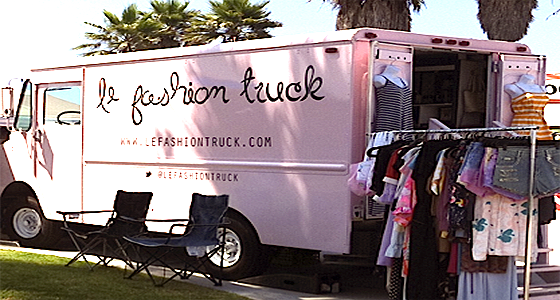 Along with a dozen or so other stylish friends, Le Fashion Truck–LA’s first boutique on wheels–is hosting a one-day mobile shopping event on the private cobblestone street that lies between the Hollywood Tower and its newer sister property La Belle. The free event is open to the public and promises a fun time with a live broadcast and DJing from 98.7FM, food trucks like Crepe ‘N Around and loads of indie designs that won’t break the bank. Some of the LA designers you’ll find aboard Le Fashion truck are Spectre Apparel’s hand-drawn graphic tees, Alex & Vina handmade jewelry, Better Than Naked vintage fashions and accessories, Fabulous on a Budget tanks and VLUX Cosmetics (made in the USA!). As for the other mobile boutiques, you can check out Original Mobile Barbershop and the Skullastic bus selling all manner of school supplies and T-shirts, Jewelmint (Kate Bosworth’s cheapo jewelry line), Patty Cakes urban nail design and Skin Owl who’ll be doing complimentary mini-makeovers. Sunday, March 4, 12pm-4pm @ Hollywood Tower Apartments, 6200 Franklin Ave, Los Angeles, CA 90028. Free admission. Love the idea of this fashionable event! You know me … I love clothes! Too bad I am not in L.A. presently. Can’t wait to go to this, sounds right up my ally!